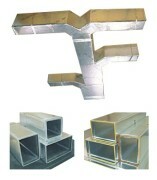 Climaver systems are alternative for rectangular metal elements. They are made of fiberglass and aluminum foil. This products is self-contained, no additions needed.